I made these using the tutorial at Dream a Lil Dream. I love the way the red stitching stands out. 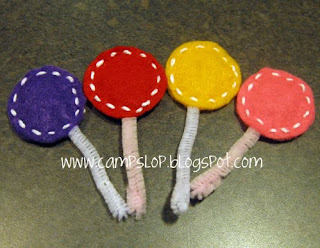 Finally, just for fun, I made felt lollipops. I used the tutorial at One Inch World. These were so easy! It only took me about 15 minutes to make all four. I love quick projects like these! 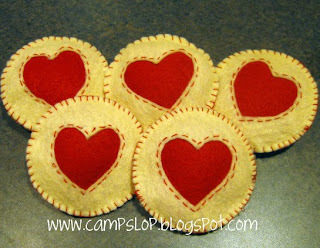 Your cookies turned out very nice! 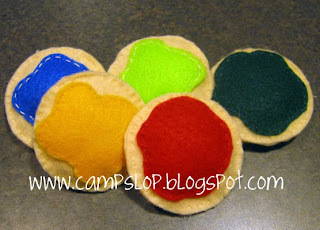 I haven't been able to begin participating in the felt food "cook along" at Helping Little Hands, but I want to. Love the lollipops too - they're adorable. I am sure your little one was ecstatic. I'm so glad you had fun with the lollipops! Thanks so much for posting a picture, I just love love love to see people making the things I have thought of.